June 17th in WordPress Themes by Wordpress Jedi . Every business needs to have a professionally designed website these days. That applies to travel agencies, hotels, tour operators, and other similar businesses. 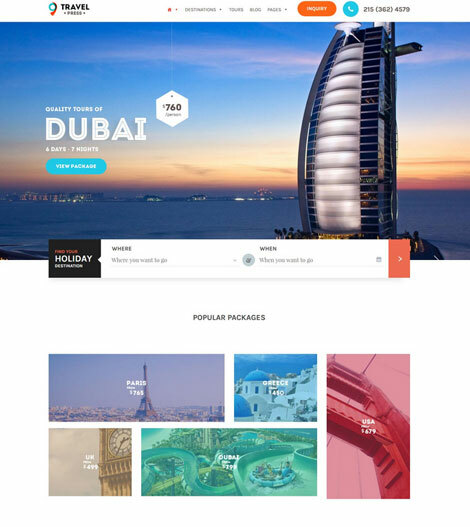 TravelPress for WordPress is a responsive theme with unlimited colors and variations and premium plugins that lets you give your business a respectable look online. TravelPress supports WooCommerce. It comes with Visual Composer, so you can change your layouts via drag & drop. 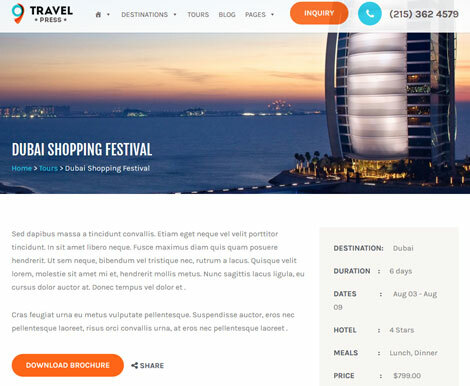 TravelPress is not only responsive but also comes with tour search functionality. Your visitors will be able to make their purchase online or fill out an inquiry form to find out more about your tours. TravelPress has multiple homepage variations and page templates. It comes bundled with Slider Revolution. This is a commercial theme.